This morning found us parked up at Tromso Camping for the 2nd day of our two night stay, and as I explained in my last blog, one of our main aims for being here was to give John a rest - so instead of driving we walked 9 miles instead😩! When we arrived here yesterday lunch time we very quickly decided we'd concentrate on our chores - washing, cleaning all the dead bodies off the outside of the van and sitting in the lovely sunshine 😂😂, and that we'd save the exploring for today. Therefore, with our picnic packed we set off this morning with the hope that we'd be back before this afternoons predicted rain caught up with us- and mostly we were! Our first stop was at the Arctic Cathedral which was designed by Jan Inge Hovig and was dedicated on 19th November 1965. It is a breathtaking building of triangular shape and has 11 aluminium coated concrete panels on each side which are inter-spaced with glass windows, and the building as a whole is a landmark that can be seen by the many Cruise ships that enter this region via Tromso Sound. 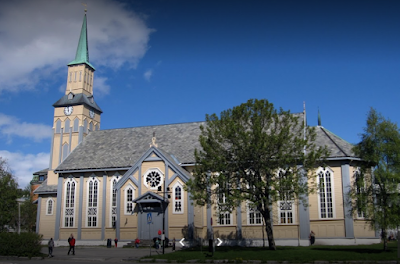 Our intention for today was to visit the main town of Tromso, which apparently is the biggest town in Northern Norway. The town lies on an island which we'd crossed via bridge and tunnel to get here yesterday, but today to get back to Tromso we were going to use a different bridge - The Tromsoebrua - which is the local name for the giant graceful arched bridge that spans the Tromoysundet saltwater fjord. The bridge replaced an inadequate ferry in 1960 and is 1,036 metres long with 58 spans of which the longest is 80 metres - and it takes about 20 mins to walk from one side to the other. It clears the sea by 38 metres thus allowing massive ships to pass under it, and it carries 2 lanes of traffic and has a bike path on one side and a pedestrian walkway on the other. Next came a bit of window shopping - we could have brought smoked dark whale meat, a troll or any amount of extortionately expensive clothing! I looked at a pretty cardi but when I noticed the price tag of over £300 I very quickly put it back - I'll wait till they have Scandinavian wear in Aldi and see if I can bag a bargain there! But as we passed through the town we did get chance to admire the many pretty wooden buildings which included the town's cathedral, and we also spotted Cliff! Our next venue required us to walk two miles to the world's northernmost botanical gardens which is uncommon in the fact that the plants there spend two full months in 24 hour daylight and sometimes the mid-night sun, and they also spend 7 months in total darkness when they are buried in snow. The flower displays included lots from the Arctic but also some from Tibet, the Himalayas and plants used in Witchcraft to name but a few. While we were there we learnt that there are over 700 species of onion, and as we wandered through the flower beds we found some blue buttercups, and along with them there were still daffodils and tulips that were flowering in July. John said there was a Troll in the rock garden! It was all very pretty and the rock gardens were quite magnificent, but by now, with no sunshine it was quite cold so after a couple of hours we decided to call it a day and make our way home. And it was then that we spotted a couple of those huge 'prison' ships bobbing about in the fjord. Apparently they charge people massive amounts of money to incarcerate them within the confines of the boat and they only allow them to get off for short exercise periods - and even then the warders are very keen to count them on and off the coaches that shuttle them quickly between one sight and the next! This morning we left the very expensive Tromso Camping behind and headed to the Rema 1000 store to do some cheap shopping😂😂 - but that certainly didn't quite work out as planned!!! In my last post I said I didn't think groceries were over expensive but I obviously hadn't worn my 👓 because today Norway lived up to it's reputation of being one of the most expensive countries in the 🌎!! My basket would have probably cost about 38 quid in the UK but here it was nearly double, and it was mostly the fresh stuff that was expensive - a bunch of🥕🥕and 🥦 at £3 each, and fruit was extortionate😭! Therefore, it's a very good job that every nook and cranny within T4rdis2 is crammed with non perishable goodies and non food items that will help maintain the house keeping status quo while we're here - it's amazing what you can make out of tins of corned beef and pilchards! I think John thought I was barmy when I kept shoe-horning things in but I'm sure his belly will be very glad of it now! 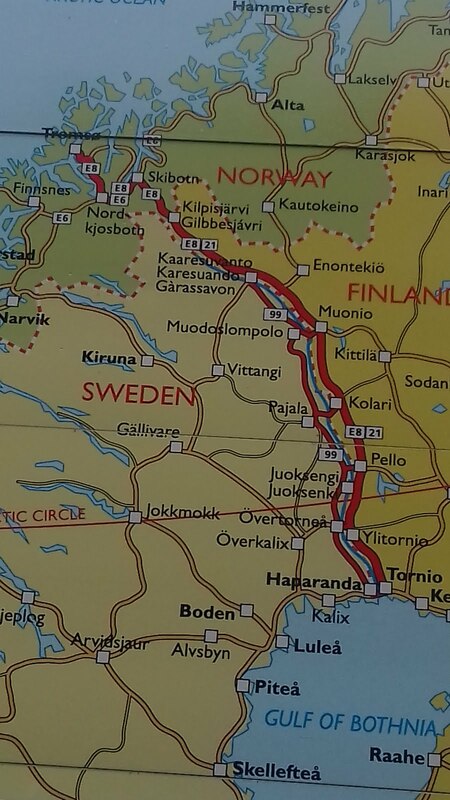 Anyway, once that job was done we got underway on today's part of our continued trek to Nordkapp, and initially that was in a southeasterly direction along part of the E8 which is known as The Northern Lights Route. 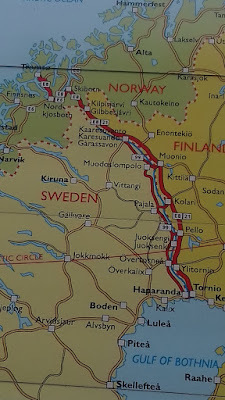 The total length of the route is 386 miles and it starts in Tornedalen in Finland and more or less follows the Finnish/Swedish border all the way up to Norway where it finishes in Tromso. 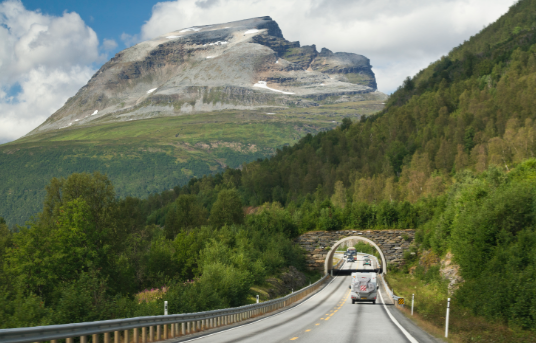 The road can also trace it's history back for a long way - apparently it was originally constructed for reindeer and sleds and was only navigable in winter, however when German occupation arrived in Norway a proper traffic road was constructed. The E8 eventually met the E6 and that beautifully scenic highway carried us past more magical fjords, waterfalls and snow capped mountains, and once we parted company with it we didn't have far to go to get to tonight's free isolated camping spot which is on the edge of Skibotnutlopet National Park. The bit of water we're parked beside is called Lvgojohka which I have no idea how to pronounce, but it's another lovely spot that has plenty of long and short walks right from our doorstep. However, although we went out we didn't stray to far because rain was threatening, but John had fun skimming stones and we also got to watch the tide come flooding in! This morning after breakfast in the sunshine at our lovely overnight parking spot we were soon back on the E6 with about 180 miles to go. The first part of it hugged the shore of the massive Lyngen Fjord where the snow capped mountains on it's opposite bank were mirrored in it's still calm waters. And along the banks there were plenty of other campers, both in tiny tents and motorhomes, all enjoying this magnificent area! As we travelled I said to John 'I just can't find words to describe how beautiful it all is', he replied 'just put it's effing awesome' 😲! The road we were travelling along had more short sections of road works and in those places there was lots of evidence of rock slides that included some mighty big boulders lying in the ditches very near to the road side, and it seems because of this tunnels were being dug that ran for several miles to bypass the risky sections. Therefore, sometime in the near future I'm sure everyone will be redirected through them, and thus the lovely panoramas we were so much enjoying will soon be hidden from view. About half way through our journey we found we needed to refuel - 😭at the equivalent price of £1.50 per litre😭 - that's probably the most expensive drink T4rdis2 has ever had! Then as our journey continued we had to pass through several existing tunnels, some of which were over 3 miles long, therefore when you popped out after being in those dark cavernous depths for so long it was really quite dazzling! Eventually the Lyngen Fjord gave way to Kvaenangen Fjord but the E6 continued to follow the very edge of nearly all the 'fingers' of these great bodies of water, thus providing a very convoluted and much longer route than if we could have gone 'as the crow flies' ! Therefore, our lunch was quite late but taken overlooking yet another breathtaking vista near Burfjord, and after that the route took us inland for a short while and then back onto the edge of Langfjorden - and it was while we were no this bit that we had another couple of Reindeer encounters. The creatures were quite happily just trotting along the main road without a care in the world! Our target for today had been the town of Alta but about 20 miles before we got there we found another free spot in a Lay-by overlooking the water so we quickly decided we'd gone quite far enough for one day. And it was just as we were sat sipping out tea that a tractor passed us for the 3rd time - 🚜🚜 🚜 but this wasn't just any tractor - it was one that was being used as a recreational conveyance by a couple for their camping holiday! Our parking spot for last night had been ok but maybe a bit nearer to the the road than we would have liked, and although the traffic noise didn't disturb John it intruded into my ability to 😴😴😴 quite a bit - but I hadn't got to drive so it didn't really matter! This morning our journey continued along the E6, and after only about 15 miles and just before entering the town of Alta we passed by the Cathedral of Northern Lights. It's architecture was inspired by the Aurora Borealis - a phenomenon which only occurs in spring and autumn so we wont be seeing it on this trip, but the Cathedral itself was quite stunning. 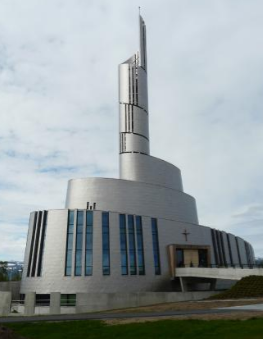 It's a titanium clad building that opened it's doors to visitors and worshippers in 2013, and it has a spiralling body that winds it's way up to form a pointed belfry that is 47 metres above the ground. From there we proceeded a few more miles further into the town of Alta to check out a wild camp spot that had been recommended by some other bloggers. Our reason for doing this was because we thought it might be a useful stopover on our return journey, but to get to it we had to pass through a narrow residential area and when we landed on it's co-ordinates we seemed to be encroaching into a tatty marina and fishermen's parking area. Therefore, the site was quickly deleted from John's Ipad and we'll look for somewhere else instead. And that somewhere else soon came to light because a little further down the road was another picnic site that was set well back from the road and was complete with table, chairs, toilets and a view that would do very nicely - and it also served us well today by allowing us to service T4rdis2 and have an early coffee break. After Alta we rolled on into the Wilderness area of West Finnmark and we were greeted by hills, mountains and huge tracts of barren scrubby land with regular signs indicating that reindeer and moose were likely to be roaming. There were also occasional 'villages' were either small caravans or huts served as lodgings and wigwams as shops for the indigenous Sami people to whom the reindeer belonged. They must live incredibly hard lifes when they have to survive in the depths of winter in 24 hour darkness and snow for more than 7 months of the year. Eventually our journey took us alongside the Porsangerfjorden and we swapped the E6 for the E69 which proved to be another incredibly impressive road that led us through long tunnels and finally on to tonight's parking spot which will only leave us about 70 ish miles to travel tomorrow to Nordkapp. The only drawback was the parking place was obviously a stop off point for the tourist coaches who kept pulling in and disgorging there troops of passengers who seemed very keen to dash down onto the beach to build small cairns - we did wonder if someone comes and knocks them all over in the night thus leaving a clean 'palette' for tomorrow's visitors! After a cuppa we left the madding crowds behind (there were only 5 coaches altogether and they'd all gone by 6ish) and headed up the hill that provides the backdrop for this little area, and from a distance we admired the waterfall that was gushing down from the mountain top! And for tomorrow we've timed our arrival at Nordkapp to coincide with John's birthday and we're planning to spend the day exploring the area before finishing it off with a special supper cooked by yours truly, and of course I'm sure we'll also indulge in a drop or two of a special bottle of vino tinto 🍷🍷that we purchased in Sweden - (or to give it it's Norwegian name Rodvin)! And then after that (on the 11th) it will be time to start our long journey home😟 but that's likely to take another 10 or 11 weeks 😃 so we wont be back in Blighty anytime soon!